Saul had been issued a directive and he was not disobedient to the heavenly vision. He rose from the ground but when he opened his eyes he could see nothing. Slow, fragile, freaked out, uncertain. What happened to me? Who was that who spoke to me? I never heard this voice before. Nobody in the party knew. But his companions led him by the hand toward Damascus. For the next three days Saul remained blind and he neither ate nor drank. As the sun was about to set, he fell into a trance, like Abraham who had spoken with God beneath the stars¾a deep, terrifying darkness enveloped the Pharisee as he took each careful step toward the city, like a man walking in his sleep. This deep sleep was the prelude to future revelations for God reformed Saul from his status as the messenger of Satan to his true vocation to preach to gentiles, kings, and Israelites. A three-day incubation period was necessary—like Jonah in the belly of the whale; like the Son of Man in the heart of the earth—as he remained locked within his thoughts and peered into his soul no longer with the eyes of the world but with the eyes of his heart. (see Acts 9:3-6, 8-9). Saul was reborn. The interpretations of what happened to Saul after the vision and in the years that followed are as numerous as the sands on the shore of the sea or the stars in the sky. What thoughts filled his heart as he lay helpless and blind, abstaining from food and water and praying to regain his sight? Did the soldiers with whom he traveled from Jerusalem to Damascus really lead him by the hand? Suffering from sudden blindness, unable to recognize landmarks, and in danger of tripping over stones along the road, Saul instead was lifted onto one of the horses in the caravan. In Saul’s mind everything went horribly wrong. By his own high standards, he failed to carry out what he believed to be his great commission from God. The mission to Damascus was over. How could he return to Jerusalem? Saul struggled to make sense of what happened. He was struck blind three hours south of the city and issued a directive from God who spoke to Saul from behind the sun, the source of light and warmth. He insisted that they press on toward Damascus where there awaited for him further instruction from the Lord. Get up and go into the city and there you will be told what to do (Acts 9:6; 22:10). Why should the soldiers listen to him? No longer was he the leader of the legion but a casualty who needed triage. There was dissension among the ranks as their mission became fraught with difficulties that none of them could have anticipated. Clearly their leader was wounded, but reports among them were conflicting. Some heard the voice but did not know whom it came from. Others saw the light but did not hear the Lord’s voice. Every single day’s journey over the hot plain, the terrain south of Damascus, bleared the eyes of men unaccustomed to desert travel. Saul never doubted the validity of the vision, for as a faithful Jew he believed in Revelation. Adam, Noah, Abraham, Moses, and Daniel¾all encountered the light and the voice of God. Still he thought, who am I that I should receive this vision from heaven? What does God want from me? Saint Luke the author of the Acts of the Apostles narrates that the revelation happened at “about noon.” Saul and his companions had a few more hours of daylight to reach Damascus until the gates closed as sundown. The guards at the gate remained on high alert now that the Arabian king Aretas IV had seized control of the city, wresting the Syrian capital from Herod Antipas who angered Aretas by divorcing his daughter Phasaelis in favor of Herodias. Aretas controlled Damascus from AD 36-39, the “three years” during which Saul began his ministry (Gal 1:18). Now his men rushed to arrive at the city before the gates closed. Saul was not only blind but shattered and powerless and unaccustomed to surrendering his life to the care of others, mercenaries, men he did not know or trust. They crossed a bridge that creaked beneath Saul’s unsteady steps. In his blindness his other senses grew more acute, his mind intruded upon by the woodpecker tapping trees and squirrels racing from branch to branch. For eight days they travelled through the stillness of the desert; Saul’s nervous system was over-stimulated, running on adrenalin from the persecution over which he presided in Jerusalem (Acts 8:3). Now the final stretch of highway thrummed with human and animal activity. “Damascus trafficked with you for abundant goods, because of your great wealth of every kind, wine and white wool,” the prophet Ezekiel preached (27:18). Bedouins, tribes of semi-nomadic Arabs on horseback¾and mercenaries of Aretas¾guarded the gates, armed with javelin, dagger, and scimitar. Passage into the city was not guaranteed. They reached the southern gate of the city before dark but the Bedouins interrogated them. Where are you from? What is the purpose of your visit? How long are you staying? Damascus was a frontier town and transients were common but its citizens remained on alert following the takeover by Aretas. What’s the matter with him? One guard asked, referring to Saul, slumped atop a horse. Sunstroke, the captain of the guard said. Fair enough. They had seen it all before. The guards lowered their weapons and allowed the travelers to pass. Only with difficult did they advance amid the crush and confusion of the masses cramming the streets. The Via Recta, the Street called Straight, extended before them between rows of Corinthian columns. Only with inconvenience did they advance amid the crush and confusion of the masses through the marketplace at the end of the day until they arrived at the house where they were expected, the house of a man named Judas on the Via Recta (Acts 9:11). Even Saul in his blindness and fatigue, with his own sad thoughts and his need for rest, felt relieved now that they had completed the journey. So far. A banquet was prepared in honor of the high priest’s top prosecutor. The porter opened the door and led the company through the courtyard with a cistern in the center, a fountain gently bubbling spray. Before his guests the host spread every delicacy available: fresh new wine, ice from Mount Hermon, and copious amounts of fruits, vegetables, rice, meat, and fish from the Damascene plain. Nobody ate until the guest of honor arrived (1 Sm 9:13) and when they were seated the host prayed the blessing: “You must first praise the Lord, for the good country that he has given you” (Dt 8:10). All responded cordially by dipping each morsel into the dish before them on the table¾except one: the chief guest. He sat propped up in the place assigned to him, silent and motionless, like a skeleton. “He neither ate nor drank” (Acts 9:9). Trembling and astonished (Acts 9:6), pondering the morning, terrified of approaching night, the official of the Jerusalem Supreme Court refused to break his abstinence. Neither the host nor the servants could persuade Saul to take food or drink. No morsel, not a drop of wine, not even water, passed his lips that night. Darkness fell and the lamps were lighted. A servant led the blind guide from Jerusalem to a room at the back of the house. At last, relief from the day’s horrors, solitude to meditate on the Scriptures, to figure all this out. Who was that man who spoke to me? There had to be a biblical basis for the counter between human and the divine. The answers are the Scriptures; the Scriptures are the answers. “As the shepherd snatches from the mouth of the lion a pair of legs or a tip of an ear of his sheep, so the Israelites who dwell in Samaria will escape with the corner of a coach or a piece of a cot”(Am 3:12). For three days and nights Saul remained in the back room of Judas’s house, eating nothing, drinking nothing, only the faintest light penetrating his eyes. He prayed, “Darkness is not dark for you, O Lord, and night is as clear as the day” (Ps 139:12). A night and a day passed. Saul could draw no distinction. Still blind, he remained in the back room, continuing to fast and curled up on the couch where they flung him the other night after the party. He called to mind the book of the prophet Isaiah: As King Hezekiah lay dying the prophet Isaiah offered to his Lord no comfort, only a prophecy. “ ‘Put your house in order, for you are about to die!’ Hezekiah turned to face the wall and prayed to the Lord: ‘O Lord, remember how faithfully and wholeheartedly I conducted myself in your presence, doing what was pleasing to you.’ And Hezekiah wept bitterly” (2 Kgs 20:2). Saul prayed diligently, called upon his God from the depths of the abyss: “Out of the depths I cried to you, O Lord; let your ears be attentive to the voice of my pleading” (Ps 130: 1-2). “But you, O Lord, how long? I cry for help, but you do not listen!” (Hb 1:2). He prayed and another vision was given to him. A man named Ananias was to come and lay hands on him, to restore his sight and offer him the way to eternal life. When would he come? Why delay? Saul’s heartsickness faded and a new hope dawned before his eyes. On the third day he received the vision. Now he waited for the vision to come true. Ananias was a respected member of the Jewish community at Damascus. He was also a follower of Jesus and the leader of the Damascene church, a group that grew large because of Saul’s reign of terror in Jerusalem that drove many Christians from Jerusalem to Damascus. Ananias hurried toward the house of Judas on the Via Recta. The door opened and the porter admitted Ananias and then led him through the hallway to the room at the back of the house and there he found the young man, not yet thirty years old, a beardless Jew, rapt in prayer. How long has he been this way? Ananias queried. Three days, the porter replied, during which time he has neither eaten nor drank. Leave us, Ananias said. The porter left. Ananias stood over Saul. So it was true, thought. Here he was, the mighty Saul, on his knees, exactly as the Lord said he would be. The conqueror was now helpless as a child. The Damascene priest trembled when the Word of God dispatched him to baptize Saul yet he obeyed the divine mandate and he healed and baptized Saul, thus making him a Christian. 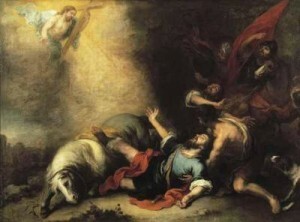 Ananias was critical to Saul in first receiving and then mediating God’s missionary call to Saul (Acts 9:15; 22:14-15); in instructing Saul about baptism, the ‘washing away of sins’ and being ‘filled with the Holy Spirit; and for (likely) bringing Saul into the fellowship of the disciples of Damascus, after which he began to preach in the local synagogues (9:19b-21). That did not happen immediately. First Saul needed to learn about the faith. Ananias instructed Saul in the ways of the Lord and then Saul fled Damascus and entered the desert for forty days and forty nights to be instructed by Christ through visions and locutions. Thus the Lord taught Saul what he had spoken of with the apostles: that the Son of Man must suffer and be killed and on the third day be raised. First he was to be baptized and cured of his blindness. Standing over the blind man, Ananias said, Saul, my brother, the Lord Jesus who appeared to you on the road by which you came, has sent me that you may regain your sight and be filled with the Holy Spirit. He laid his hands on the bald pate of Saul and immediately things like scales fell from the Pharisee’s eyes and he regained his sight. Now, why delay? Ananias asked. Get up and have yourself baptized and your sins washed away, calling upon his name (Acts 22:16). Then Saul rose and was baptized, and took food, and recovered his strength (Acts 9:18-19). His definitive “yes” to Christ in baptism restored Saul’s sight and made him see in a way he never had before. In ancient times, Baptism was also called “illumination,” because the sacrament provides light for the eyes of the soul; one sees through the eyes of eternity and not through the eyes of the world. Saul, healed of his inner blindness, sees the world in a way he never saw before. “Thus Saint Paul was transformed, not by a thought, but by an event, by the irresistible presence of the Risen One whom subsequently he would never be able to doubt, so powerful was the experience of the event of the Risen One coming into his life. It radically changed Paul’s life forever, for he saw the face of God and lived. The Spirit at Baptism rushed upon him and he hastened to tell another person about the grace that he received through the vision and through his baptism. His eyes were opened. He saw everything as it was: in Christ. Alfred Loisy. The Career of the Apostle Paul.